Windshield Sun Shields - CarCoverUSA, Inc. Direct sunlight, and the resulting extreme interior heat inside your vehicle, are the prime causes of damage to your dash and seat materials. The simple fix is to effectively block that sun, and harmful UV rays, with a custom patterned windshield heat shield from Covercraft Industries. Their UVS 100 Heat Shields are tailored to fit your vehicle’s windshield perfectly, reflecting the sun and keeping your interior much cooler. Covercraft’s UVS 100 Sun Shield features triple laminate construction, an outside silver reflective surface and a soft felt inner surface. Foam core, laminated between the two, acts as a heat insulator. Because they are custom patterned for the vehicle they fit closer to the windshield surface and can more effectively reflect heat from the vehicles interior. These lightweight custom fit sun shades utilize either an accordion style fold up or roll up for compact storage, and an optional storage bag is available. The UVS 100 Sun Shield is held in place by your vehicle sun visors. 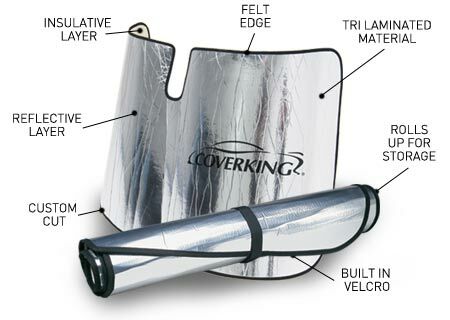 Coverking’s sun shield Ultra is the latest high tech development for the ultimate sun control in parked vehicles. The Ultra blocks 99.8% of heat and UV radiation, thus offering the ultimate protection for auto interior. The ultra has a unique 3 layer construction. The top layer is a polyester 300 denier fabric with silver polyurethane coating to reflect most of heat and radiation. The second layer of unique high density polystyrene offers total insulation and the third layer of soft polyester felt protects the insulation and encapsulates the sunshield.The Ultra is custom cut to the exact shape of your vehicle’s windshield and finished in matching felt binding. The custom shape completely blocks any light from penetrating inside the vehicle. It is also easy to install and remove.